Each year, as part of our congressional charter, the Boy Scouts of America is required to present a report to the speaker of the U.S. House of Representatives. This report covers who the BSA is as an organization, the programs and initiatives we support, and our major accomplishments and contributions over the past year. This report is a presentation of who we are and what we do as a community — from the organization as a whole down to each individual unit. Thus, we each own a little piece of it. To bring that important point home, each year a delegation of representatives from a range of Scouting programs is selected to travel to Washington, D.C., to share how Scouting’s programs are building lasting character in the next generation of leaders and strengthening communities through service. 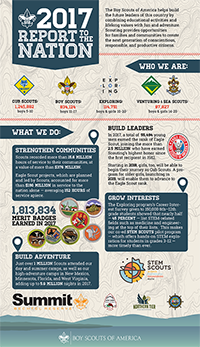 The delegation represents all areas of Scouting and every region of the country.